Honor361 is planning to build the South Texas Iraq/Afghanistan War Monument in Victoria, TX. This monument will honor those who served in the longest war in U.S. History and those who gave the ultimate sacrifice. This is a local monument which will have a personal effect and will be a place of healing for those who served from the 361 area code and their loved ones. The bronze portion of the monument will be the famous image of Marine LCpl Colton W. Rusk, from Orange Grove, Texas, and his Military Working Dog “Eli”. Rusk was killed in action in 2010 while serving in Afghanistan. Rusk is kneeling in front of a Battle Cross which is made up of a rifle, helmets and a pair of boots to honor a fallen service member. This will sit on a large foundation made of Texas granite which will have all the seals of our Armed Forces. Surrounding the centerpiece will be 3 large granite “T Wall” barricades (used for protection in Iraq/Afghanistan) that will have the history of each war and of the South Texas Iraq/Afghanistan Monument. The walk leading to the monument will have 4 stars. A Gold star will represent family members who lost a service member in combat. A Silver star will represent family members who had a service member injured in combat. A Blue star will represent family members who had a service member deployed. A White star will represent a family member who lost a combat service member who committed suicide. All stars will serve to honor and as remembrance. The monument will be surrounded by flag poles. The U.S. and Texas flags will be centered and surrounded by each flag of our Armed Forces. Lastly, the side leading around our entire monument will have bricks that can be purchased by anyone to Honor a Veteran or give thanks to our Troops. 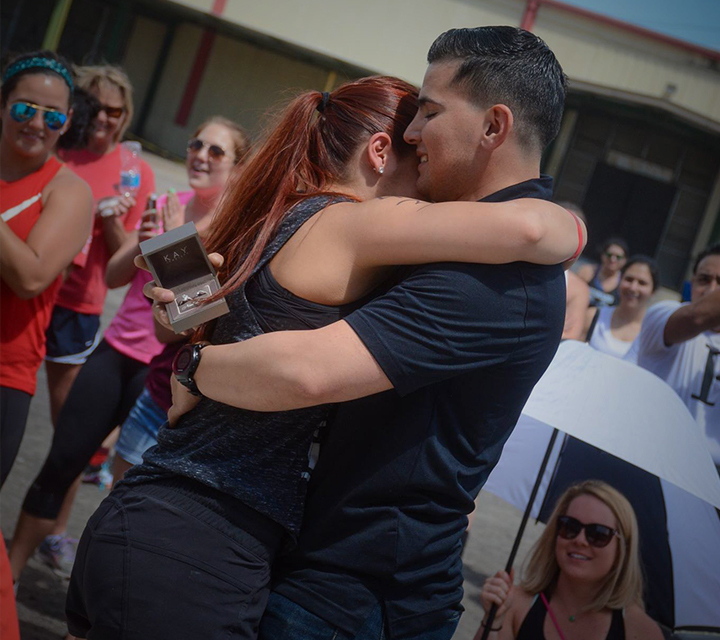 Army Ranger surprise engagement at an Honor361 event. Honor361 hosts events throughout the year to raise money to fund the monument and the operation of the organization. Through our events many families have already been blessed and many servicemen have been impacted.